Hey, all! So today I am sharing my review of some Luminance Skin Care products the lovely company was generous enough to send me. Oh aaaand I am hosting a giveaway of their goodies, so read on for your chance to win! All their ingredients are certified organic, or wildcrafted (AKA organic but not certified). I have been using their cleanser, toner and moisturizer for a couple weeks now and my skin is clear and glowing every day, even in this crazy heat when I am sweating in my sleep! The products smell divine because they are made of essential oils and rose water, mostly. In fact I have learned a little something about skin care by using these products. Apparently tap water has a pH that is not suitable for our skin, but Luminance's toner made from rosewater, has almost the exact same pH level as your skin! Huh! Even though I am about as healthy as a girl can be I still have very sensitive skin, yet I can confidently say that using these products has been delightful; I can use them daily with only positive results. They are so gentle and nourishing, and my skin can tell. The people behind the company are also wonderful. They genuinely care about you, the environment, and the animals. Their products are NEVER tested on animals, except in a phone call with the head of Luminance, Kim, he admitted HE is the one animal they test on. Chuckle chuckle. That is my short but sweet review. I love these products, and I highly recommend them. If you want a chance to win some for yourself, enter below by commenting on this post with a question about their products. Luminance Skin Care will be checking out the comments and picking a winner soon! If you don't end up winning, Luminance still wants you to try their products! They are giving you 20% off all products with the discount code "VEGAN". Woohoo! Use it on their site right here. I have oily skin. I used to be on acne medication before taking up my mostly raw diet. My skin is much better, but I still have occasional flair ups. How is your product for oily skin? I read about the rosewater cleanser for acne-prone skin. Even though the product contains oil, the company assures that it will not be to the skin's detriment. We all seem to be brought up to believe that oil is bad for the skin--why is this not really the case? I have keratosis pilaris all over my face, arms, and thighs. Will this help keep it at bay?! I know It'll be somehting I have to use everyday but I need help!!! Are these products okay to use during pregnancy? I have very acne-prone combination skin, but it's also very sensitive. What category should I be looking at on the website? i think my dry skin would appreciate these lovely products very much! thank you for hosting this giveaway! I have extremely sensitive skin that is also acne prone...it is a tricky skin type to treat so I am wondering if these products will be effective but still gentle? What product combination would you recommend for sensitive, dry skin? I have a genetic conditionm which is called "keratosis pilaris", therefore the skin on my upper arms has always been rough and partwise red. I tried a lot of therapies with essential oils and hamamelis water, but if it was getting better, it didn‘t last for long. May luminance skin care products be an option for a healthier, better looking skin? I have sensitive skin also and am always looking for new products. Very excited about this giveaway! Will these products help get rid of dark spots/sun damage or help reduce future damage? I have really dry skin and everything I use makes it drier. Would this be good for me? will these products brighten up my skin when it looks grey and dull? happens especially when im really busy and stressed at uni! Am looking for new beauty products to stock up on before I go away to college! Just like with the food I eat, I would prefer to use products with an ingredient list that I can pronounce and understand. Plus, rosewater smells AHHH-mazing. I look forward to trying out Luminance! Yummm! These look so fragrant, clean and lovely. I can't wait to feed my skin a little! I'm curious where y'all source your ingredients from, especially the "wildcrafted" components? Do these products work with all skin types? PS and I totally agree Vancouver is super hot this year! ! ! LOVE UR BLOG! My skin has been breaking out so much lately -- I feel like it's trying to tell me that now is the perfect time to switch to more natural products! But I'm nervous -- will these products help reduce break outs while still offering moisture to my combination aging skin? How open has the mainstream market been towards your company and have you encountered significant difficulties in this aspect? Will this giveaway be valid for Colombia? Oily skin can be caused by synthetic cleansers which are made up of nasty unregulated synthetic petroleum derived chemicals, and are designed to remove all the oil off of your face. They are literally grease strippers. The problem with this is that they wipe out all of the healthy oils that your skin produces to protect your skin, and disrupt the feedback mechanism that your skin has that regulates oil production causing oily skin. The other thing that affects the oiliness of skin is the pH of tap water. Tap water is far too alkaline for skin so one should always lower the pH of the face with a pH adjusted toner after exposing it to tap water. What are your top 3 sellers? My question is... how easy is it to get my Hot little hands on the products in Australia and are they suitable for sensitive acne prone skin?? I make my own toner and have used distilled and spring water, I'm thinking I need to find something with a lower pH! It's the summer time and I take a super hot shower every day and try to scrape away as much oil as I can from face, mostly my nose. Then I get out of the shower and just an hour later, my nose feels oily again! I keep having to rub away the oil with a towel, but it seems like no matter what I do, it never goes away for at least a day! I don't want to use cleansers with harsh chemicals that will leave my skin feeling dry though, which is often the case when it's the winter. How are your products for acne prone skin? I have been trying to transition into a natural-skincare regimen that still keeps my acne at bay. I have very sensitive and dry skin and the only thing that really works is natural products like these. I'm wondering if the smell of the products are subtle or strong, and do they all smell of rosewater? Is this product super fragrant-y? Do you make makeup products? Are your products also gluten free? Are some products more versatile than others, good for both winter and summer? Are all of the products in this line suitable for sensitive skin? I'm wondering how your products do with rosacea? My mother has it and I've been looking for something natural and vegan for her that won't be an irritant. these look great! I've stopped using conventional soap on my face and instead use just a little apple cider vinegar rinse now and then, but it leaves my skin somewhat dry. This looks like a much better idea! I was also looking at the soaps, which say they use organic palm and coconut oil. I wonder if the company also uses, or plans to transition to, fair trade oils. environmental justice is pointless without justice for humans, too! What are the ingredients in the moisturizer? I have sensitive, acne-prone skin, and have been on antibiotics and prescription medications for a few years to manage it. The antibiotics have wreaked havoc on my digestive system and I am transitioning away from synthetic medications to natural remedies. What ingredients in Luminance products will help with my acne? I have dark marks and some acne scars. Will your products help fade them over time? Do you have any products that are made specifically for fading acne marks? I would absolutely love to try Luminance skincare. I have always had decent skin, and have never had to deal with acne, but it is dull, uneven, and sometimes bumpy. I feel like i have to wear makeup because people ask me if i'm sick if I don't! I eat a great diet, but I think adding these products to my routine would be great! I am so excited about your products! It is a relief to find a line that is not only organic and vegan, but also free of toxic chemicals that seem to plague most products, both commercial and "natural". Thank you! It is just important to feed your skin as well as you do your body. I have very finicky skin because it is both oily and dry and it has been a pain to find a balance. Do you have any products that would suit my needs? I've never used any kind of rosewater product, so I was wondering, does it smell like straight up roses? And is it just pure rosewater (roses+water) or are there other ingredients? Why are your products divided in age groups? If a younger person were to use products in the "Mature" category would their results be less good? Thx. I would love to try these products, thanks for offering this giveaway! These look wonderful! Do any of your product focus on acne? These look great! I've stopped using many products for my face because they are too harsh on my skin (aka major companies). When I do get new make up or face cleansers I get excited when I can read all their ingredients! I find they work the best! What do you suggest for dark circles? My skin is already pretty healthy, so how could this product help me? It looks great though! amazing. exactly what I need. I really, really want this! We live in Florida and its always hot and humid. How do your products perform in that type of weather? These products sound fantastic! Are they gentle on overly sensitive skin (like mine!)? Also, I would love to know more about where you source your ingredients from! Do you have any products that help fade scars? A couple years ago I had some pretty severe acne on my forehead. I went to the dermatologist and she recommended a gentle, non-comedogenic cleanser (which I love.) I also went on antibiotics for a few months and was prescribed two creams, one with Dapsone gel in it and another with Benzoyl Peroxide. My skin is clear now, thanks to these two creams in addition to the antibiotics. My problem is this: I would rather not put peroxide on my face if it is not necessary, but I am afraid of my acne coming back. Are there any Luminance products that I can use in my transition period when I am stopping the medicated creams? I also have oil skin like some other commenters. Do you have specific products, like toners, that help combat that? I am allergic to nickel and cobalt. Do any of your products contain these metals? Sounds like your in the viscous cycle of a synthetic cleanser. Like I was telling Heather, cleansers are typically made with petroleum- derived grease strippers which are excellent at removing all the oil on the skin. This is not a good thing. You are right to want to move away from that! Instead you want a gentle soap based cleanser and when you get out of the shower use a toner to lower the pH of your skin. (Tap waster is very alkaline, too much so for skin and this can cause oily skin.) Also, don't use anything other than your fingertips to clean your skin. Your skin is very smart! When you use abrasive cloth or scrubs on your skin it thinks it's being attacked and it produces more oil to protect itself. (You are also exfoliating indiscriminately which can reduce your natural protection against UV rays and allow moisture to escape). We make a soap based facial cleanser ($18) that will gently cleanse and deeply hydrate your skin. If after you jump out of the shower you spray your face with our Rosewater toner you will adjust the pH back to it's normal range (low 6's). Your skin will be gently cleansed and balanced. This should give you some releif. Also be extremely careful about the moisturizer you use on your skin. After all the work you do to balance your pH and regulate oil production you don't want to undo it with glycerin, mineral oil, alcohol, astringents or waxes! No! Absolutely not! Our products have a 6-8 month shelf life because we refuse to use any metals or synthetic compounds to enhance stability of emulsions.We make everything fresh so they haven't been sitting on the shelf for more than a week or so. So we think 6-8 months is a reasonable amount of time. Also, we completely stand behind our product with a "Nordstroms return policy" so if there are any products we replace or refund without a hassle. Our products may not be for everyone but we love our customers and we do our best to treat them wonderfully. If you have anymore concerns don't hesitate! PLEASE don't leave out lip care! i'm concerned with wrinkles, my first lip wrinkle at age 46! we basically need to treat that area as much as we do our eyes. are you anticipating a lip product other than the balm? Unfortunately we don't and I would be very skeptical of anything that claims that it can fade scars. Be careful! What kind of consistency are the moisturizers, and do the ingredients tend to separate over time? Cannot wait to try these at some point! I rarely get to buy skin care products so will definitely be saving up, they look really great. wondering if your products can be used for sensitive, mature skin that tends to have T-zone breakouts? Cool! Would love to try some. I have skin that's very oily and prone to acne. Is it available in the US too? I'm sure this will be a FAQ on your website soon: Do you ship worldwide? I'm always on the hunt for new beauty products. Are these hand crafted? Great question. The main differences between youthful and mature skin happen in the moisturizers. Deep Hydration (recommended for mature skin) Has Tamarind and Taminu Seed oil which both bring water to the upper layers of the epidermis(gives a glowing appearance) and also increases elasticity and suppleness. After 30 years of age women stop producing collagen in the skin so these ingredients make a big difference. The Hydration moisturizer has a higher ratio of Meadowfoam oil which is an amazing anti-inflammatory. This is great for younger skin which can be more prone to hormonal breakouts. How are these products for sensitive skin? My skin is acne-prone but also sometimes dry. Which products would be best? Do the natural ingredients in your products become less effective unless used within a certain amount of time? How long before products go "bad," if ever? Do you have a primer product? My eye shadow refuses to stay put! I was just wondering, how long is the shelf-life of most of the products? Just want to make sure that I will be able to finish the product before it expires! are these good for full body as well? Sounds wonderful, but what is raw and vegan about it? I love natural products, I'm curious whether they also provide hair care products? Or products as herbal remedies? what kind of treatment should i use for the acnee skin? These sound great! I'm curious, where do you source your ingredients? Are they primarily locally sourced? For items that are not local, are workers fairly compensated (fair trade)? Thanks! These products look great! I love anything with rosewater. i greened my routine 8 yrs ago, and never looked back: skin care, makeup, haircare, body care, what I put on my kids, how I clean my house, and how we eat. I am always looking for new products to try and to educate my friends about! I've tried MANY different skin care products having had acne for literally half my life. I'm in my 30s now and it's relatively under control, but I still get flare-ups. How is your product on adult acne? That toner! WANT WANT WANT. I am a huge sustainable beauty supporter and this line is great. I have very sensitive skin; are all your products suitable? Thank you for the giveaway! YAY for raw, organic skin care - I find it insane that people are still buying and using toxic chemicals on their skin and bodies! Where do you source your ingredients from? I am also looking for skin products for acne prone skin - which ones would be the best? thanks! I saw that a lot of the products include Kukui. I have never heard of it, and am curious: What is it? Are these products good for mature skin or better for younger skin? I use 100% cocoa butter as a moisturizer on my face is this good? I have been on and off birth control pills and my skin is acting up like crazy, I'd love to try these products! This looks soooo yummy!! Love your blog!! Yourrecipes are so creative!!! I wanted to know if you offer products for specific problems/ranges of skin types (for example hyper-sensitive, or acne skin)? Also do your products repair skin and cure skin issues, or do they just temporarily 'fix' skin problems (while the products are being used)? Does it work well on aging skin? Anything for brown spots? I have very dry skin, and many skin care products have a tendency to make it even drier. Are these products good for a kind of skin like mine? I like to make my own skin care products, but it is great to have awesome options like these! Do you have mattifying creams? If I was to switch from using alcohol based moisturizers, and always using alkaline tap water on my face to using natural products would this result in a severe breakout? Is there a commonly a detox phase? If so, are there certain products that could lessen the severity of the breakouts? I've not really had problems with my skin, but lately I'm having issues with bags under my eyes. Would you recommend they eye cream or something else to help me with this? It's so exciting to discover a vegan skincare line! How long do the products usually last and do they spoil quicker than other skincare products since there aren't any artificial preservatives? I have oily acne prone skin around my nose and chin. I tend to get oily/blackheads in these areas, but other areas of my face can get sensitive too. Will these products help reduce the oil and acne while keeping my skin from getting sensitive and dry/scaly/raw in other areas? Sounds like a great company. I'd love to try some of their products. :) Thanks for hosting this giveaway! Sounds like a great deal! I have mixed skin and I'd like to know what works better for this type of skin since it's been very difficult to find a product that makes me feel fresh. Is it good to use products that contain oil? as i am living in hot and humid country, my skin, of course, is dry and oily. I have read about your product,Hydration Moisturizer. i would like to ask, how long will it keep my face hyradate in a day? what is the most perfect time to apply it on face, is it day or night? thank you! Can I use your produces on my children? I have acne prone skin so Im going to check out your products now! How long is their shelf life? Do they contain any preservatives? Finding a quality sunscreen for my son has been difficult. Is your sunscreen safe for children? Chrystal in Canada says: what a nice giveaway! Oh, to smell the fragrance described -- even amidst a prarie week-long heatwave! "Choose me, I would be a grateful recipient"
I've read all about this and have heard nothing but amazing feedback! Would LOVE to try this on my face! So, pick me, pick me! Not all oils are created equal. Argan, Kukui, Avocado, Apricot Kernal, Sweet Almond, Rose Hip, Sun Flower, Borage, Tamanu, Tamrind Seed are absolutely lovely for the skin; nurturing the skin with their wonderfully absorption characteristics; and there are many others that are nice as well. Oils with a high Linoleic fatty acid profile actually get into the pours and dissolve coagulated sebum >> Rose Hip and Sun Flower have this attribute in abundance. And then there are other naturally occurring oils that are not so wonderful for the skin; high concentrations of Jojoba, Coconut and Shea Nut Oil (commonly seen as shea butter) that have a tendency to clog the pores and isolate the surface of the skin from Oxygen exposure. And then at the bottom of the list of bad oils are the petrochemical derived oils, commonly referred to as mineral oils. I think this all comes from a general lack of understanding of how the good oils penetrate, protect and nourish the skin. Conventional wisdoms that continually misinform the next generation until we are left with the generally wide spread notion that oils are bad. It is utter nonsense. I am always available to answer questions so please don’t hesitate to call. Our products will not cure this skin issue. There is some evidence that all bovine dairy products can drastically enhance the condition. You should be avoiding all products containing casein; cheeses, milks, cold cuts, even candy and bread products. Now what my products will do for you is help keep the surface clean and functioning. I suggest our unscented bar soap for everything from your shoulders down and our basic skincare regime: Delicate Facial Cleanser, Rosewater Toner and Hydration Moisturizer. If you have a few minutes take a visit to the website and have a look at the instructions section, specifically the sections on Cleansing, Toning and Moisturizing. If you do nothing else you should never ever use any “Acid Peels” or use abrasive exfoliation anywhere you demonstrate the condition. Yes all of my products are fine during pregnancy! In fact because we go to great lengths to avoid any of the synthetic preservatives, and nasty fixatives that many “hand crafted” products and all of the commercial skincare industry rely upon we are uniquely suited for pregnancy. Funny thing about dry skin; in my experience very few people have dry skin naturally. Most of the dry skin I see is the result of cleansing with synthetic commercial or poorly made “natural” cleansers, toning with toners containing either alcohol or some astringent, moisturizers with an abundance of alcohol or synthetic wax binders and the worst culprit to dry skin is exfoliating with abrasive substances. Please visit our website and take a look at the instructions section; specifically the face cleansing, moisturizing, toning and exfoliating sections. http://luminanceskincare.com/pages/how-to-wash-your-face is the link for cleansing; the others are there as well. Yes everything we make is by intent designed to be gentle and nourishing. Now, our products will not cure your acne prone skin, but they will gently cleanse and deeply moisturize without leaving a greasy film. Please visit our website and take a look at the section on sensitive acne prone skin, for general guidelines and product reccommendations: http://luminanceskincare.com/pages/how-to-help-skin-with-acne. Our products will not cure this skin issue. But they will help keep your skin healthier for sure. There is some evidence that all bovine dairy products can drastically enhance the condition. You should be avoiding all products containing casein; cheeses, milks, cold cuts, even candy and bread products. Try to adopt a simple diet of lean meats, fish, vegetables and fruits. Now what my products will do for you is help keep the surface clean and functioning. I suggest our unscented bar soap for everything from your shoulders down and our basic skincare regeim: Delicate Facial Cleanser, Rosewater Toner and Hydration Moisturizer. If you have a few minutes take a visit to the website and have a look at the instructions section, specifically the sections on Cleansing, Toning and Moisturizing. Well! Everything we make is by intent designed to be gentle and nourishing. Our products are designed to gently cleanse and deeply moisturize without leaving a greasy film. Please visit our website. I wish I had better news, but no we don’t make anything to reverse sun damage or dark spots. What we do offer a sunscreen consisting of Red Raspberry Seed Oil providing a way to protect your skin naturally without a lot of synthetic/metallic substances. And then as usual it will help to use a more natural organic skincare line. Check out our webstore at www.luminanceskincare.com. I am always always available to answer questions or to help you select appropriate products for your skin type, so please don’t hesitate to call. I am very fond of saying that when you put something on your skin you have eaten it, you just didn’t have to chew it first. Every product we make is as clean and free of anything synthetic or in any way harmful. And designed to keep your skin healthy and lovely. Without seeing your skin it is difficult to know how to answer specifically. I can say without equivocation that our products will gently cleanse, tone without alcohols and deeply moisturize your skin. This will help your skin hold more moisture. Your skin will look and feel healthier. If you are exfoliating using an abrasive exfolient this will eventually contribute to duller skin. Check the website and visit the instructions section, specifically the sections on cleansing, moisturizing and exfoliating. Our ingrediens come from all over the world! The wildcrafted ingredients are typically from small farms. Our wildcrafted jojoba comes from Arizona Deserts. Our wildcrafted Kukui from the South Pacific islands. Our Argan from a spread of land in Northern Africa. The way we decide is if an ingredient is natural to an area and has been cultivated and harvested without anything added to the soil, plant or surrounding air we consider it wildcrafted. In general we stay away from anything cultivated in large farming areas like the central valley of California; in places like this even “organic” farms suffer contaminant migration through the soil and air from surrounding farms. We’re careful. I'm especially interested in your body lotion and butter--I live in a dry climate (Nevada) and lotion is a daily necessity! I am very picky about lotions in that besides having good ingredients, I don't want them to be sticky when they are on (my husband hates lotion fingerprints on his computer keyboard :D) or have a lingering scent (i.e. one that lasts all day ;). How are your lotion and body butter at not being sticky or too "scent-y"? You are so on target with a mostly raw diet! And in my experience overly oily or dry skin is typically the result of synthetic cleansers or commercial soaps; even "natural" products can consist of ingredients that will aggravate your skin. But when you cleanse with a pH balanced soap cleanser, tone with a low pH toner without alcohol or astringent and moisturize with a nutrient based moisturizer skin tends to normalize. Skin is very smart and resilient and when it is treated nicely it responds nicely. I have of course shamelessly described products in our line; the Delicate Facial Cleanser, Rosewater Toner and Hydration Moisturizer. I am always available by phone or email if you need more information please don't hesitate to call or send me an email. I'm especially interested in your body lotion and butter--I live in a dry climate (Nevada) and lotion is a daily necessity! I am very picky about lotions in that besides having good ingredients, I don't want them to be sticky when they are on (my husband hates lotion fingerprints on his computer keyboard :D) or have a lingering scent (i.e. one that lasts all day ;). How are your lotion and body butter at not being sticky or too "scent-y"
Our lotions are not sticky or greasy! Ever. It's all about the ingredients; the oils we use are selected for quick, deep penetration and wonderful moisturization; Argan, Kukui, Macadamia, Apricot Kernel, Rose Hip etc. And we never use synthetic waxes, fillers or preservatives. None of our luminance products are scented, they do carry the subtle and natural scent of the ingredients. For instance, the Skin Lotion is based on rosewater and so has a quiet hint of roses >> which drifts away in a minute or two. If ever you wish to ask questions directly you can always give a call or send an email. Yes our Red Raspberry Sunscreen is lovely for children, but you must keep a close eye on them and be sure to reapply every half hour if they are playing and perspiring heavily. Our sunscreen with a touch of zinc oxide is recommended for kids; there is enough zinc to keep them protected when playing but not enough to be damaging to the skin. Well I agree with the grapeseed oil but while honey is a reasonable natural anapestic, it is somewhat drying to the skin. 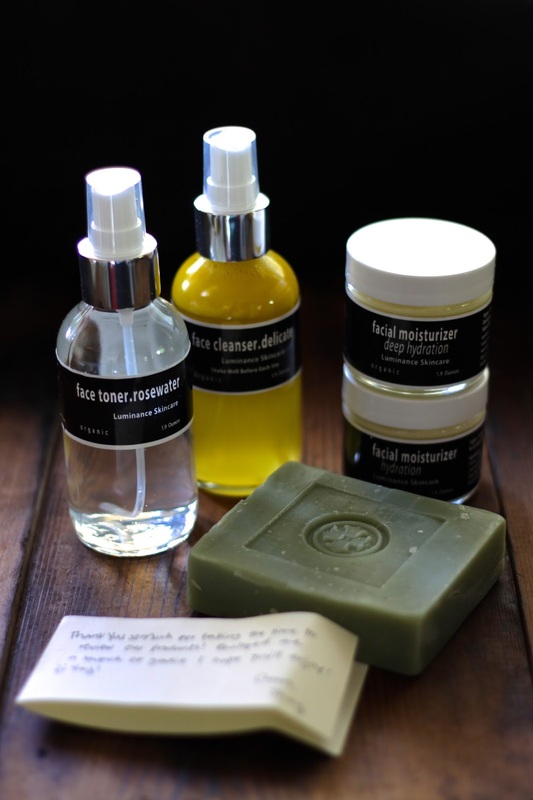 Our products will not cure your acne, but they will give you a gentle non irritating cleanse, a pH balancing tone (this is important for acne prone skin) a tea tree and macha tea antibacterial and extremely nourishing non greasy moisture. All without alcohol, astringents or anything synthetic or irritating. On our website visit the section in Instructions for acne prone skin. As a last comment, you should avoid any scratchy exfoliating. This is damaging for normal skin and absolutely horrible for your skin type. Please don't hesitate to call if you have product specific questions, I can help you if you wish. We do use fair trade when it is of adequate quality and meets our standards of organic etc. The problem with fair trade is the quality is sometimes horrible and there is wide spread deception with regard to sourcing documentation. So we seek it out and use fair trade when we can. Overly oily skin like overly dry skin often are the result of using synthetic cleansers or "natural" cleansers that are improperly formulated. Highly alkaline tap water is also extremely drying. So it is important to use a cleanser that is soap based and pH adjusted to match and compliment the acid profile of skin. It is critical that following cleansing and rinsing with highly alkaline tap water a low pH toner without alcohol or astringent is applied to the face and finally moisturizing with a moisturizer without alcohols or synthetic waxes, gums or synthetic preservatives. I recommend our Delicate Facial Cleanser, Rosewater Facial Toner and the Hydration Moisturizer (if you are under 35) and the Deep Hydration Moisturizer (if you are over 35). If you visit our website and get into the instructions sections you will find lots of good information you can use to keep your skin happy. I have combination skin, but some products still make my skin very dry. I have sensitive skin and sometimes it can look very dull. What would you suggest for my skin type? I have always wanted to try rose water! I had never heard of it until about a month ago, and I am very curious and wanting to learn more and find products that have it.